Right: Taryn Chuter, 23, of Corvallis, was crowned Miss Montana 2011. 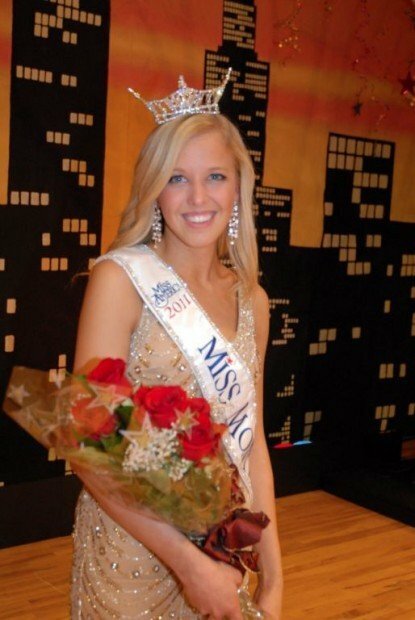 She will go on to represent the state at the Miss America Pageant in Las Vegas next January. Taryn Chuter, 23, of Corvallis won the title of Miss Montana and a chance to represent Montana at the Miss America Pageant in Las Vegas next January. Until then she is Montana's ambassador speaking to schools, conferences and at special events. Her platform is educate and motivate: preventing childhood obesity. Taryn praised her fellow contestants for being so helpful, as they've grown to be great friends during the week. Taryn wins a $5,000 cash scholarship plus $11,500 in applied scholarships and many prizes including a Silver Service tea set that Mitchell Oil Field Service has been giving to Miss Eastern MT or Miss MT for 29 years. Taryn tore her ACL in college track and has had a year and a half of rehab so it's amazing to win the talent competition with her lyrical dance. Daughter of Page Thomas and Chris Chuter, Taryn won preliminary swimsuit and evening gown in the two previous nights' competitions. First runner up was Veronika Ohlinger of Cooke City singing Black Velvet. She wins $2,500 She also won the Spirit and Leadership Award given by the production staff. Chantell Bury, 20, Glendive was second runner-up, winning $2,000 in cash scholarship, voted Miss Congeniality by fellow contestants and voted most photogenic by Right Impressions, the official photographer for the week. Chantell also won the Miss America State Community Service Award of $1,000. Third runner up Gillette Vaira, 24, of Lambert was Thursday night's evening gown winner, and received the Miss America $1,000 Scholar Academic Award and the interview award. Cortney Bury, 19, of Glendive was fourth runner-up and winner of the Friday night fitness in swimwear competition and Miracle Maker fundraising award from the Children's Miracle Network. D'Jeane Peters of Grass Range and Arlene Dwyer of Florence were in the top seven. The Miss America Scholarship Program is the largest contributor of scholarships for young women, giving out $45 million last year. This pageant differs from others in three ways, scholarships, contestants perform a talent which counts as 35 percent of their score and platform, an issue she cares deeply about.